It's weird, wild, splendidly high-brow and aurally dazzling - very much a top-end instrument for those of an esoteric bent. Experimentalists will love this. Truly unique selection of sounds. Hugely multi sampled. The ultimate avant-garde instrument, John Cage's prepared piano saw various items precisely placed on and between the strings of a grand piano to create all manner of strange and beautiful sounds. 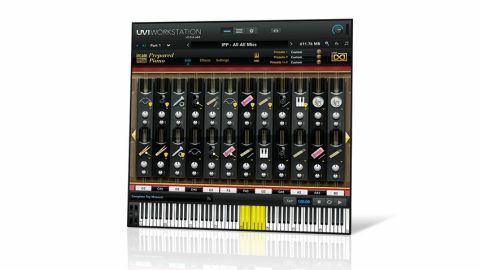 "'Preparations' applied, include clothes pegs, paper, aluminium foil, rubber erasers, an iPhone and more"
For its massively multisampled take on the concept (for UVI Workstation and MOTU MachFive), UVI has recorded over 10,000 samples (19GB) of a Yamaha C7 at IRCAM in Paris, with a good selection of 'preparations' applied, including clothes pegs, paper, aluminium foil, rubber erasers, an iPhone and more; and the piano strings played using mallets, a single- strand bow, an Ebow, a wooden stick and fingers, as well as the regular piano hammers, of course. Each note can have two preparations applied at the same time, either or both layers can be randomised across all 88 keys at the click of a button, and various editable parameters enable deep customisation.